Ross Amer, 32, of Ashdown Drive, Tilgate, was fined £185, with a £20 victim surcharge, £85 costs, and six penalty points added to his licence. He had pleaded guilty to driving without insurance. Jason Poole, 43, of Cross Path, Crawley, was fined £40, with a £20 victim surcharge, £85 costs, and three penalty points added to his licence. He had pleaded guilty to speeding. Keith Robins, 40, of Hophurst Drive, Crawley Down, was fined £295, with a £30 victim surcharge, £85 costs, and five penalty points added to his licence. He had pleaded guilty to driving without due care and attention at Horsham. Jason Tomas, 45, of Effingham Lane, Copthorne, was banned from driving for two weeks, with a £1,845 fine, a £120 victim surcharge, and £85 costs. He had pleaded guilty to driving without insurance. Jamie Flynn, 26, of Windsor Road, Chichester, was fined £110, with a £20 victim surcharge, and £85 costs. He had pleaded guilty to drink driving at Crawley. Sonny Breakspear, 27, of Holmesdale Avenue, Redhill, was jailed for 16 weeks, with a two year driving ban, and an £80 victim surcharge. He had pleaded guilty to driving while disqualified, driving without due care and attention, and failing to stop for a police officer, all in Ifield. Jake Hanson, 24, of Hurst Close, Crawley, was fined £35, with a £20 victim surcharge, and £85 costs. He had pleaded guilty to being drunk and disorderly in Crawley. Agris Balodis, 47, of Marine Terrace, St Peter Port, Guernsey, was given a 16 week jail sentence, suspended for a year, with £200 compensation, an £80 victim surcharge, and £85 costs. He had pleaded guilty to two counts of sexual assault by touching at Gatwick Airport. Darren Scala, 41, of Cole Close, Broadfield, was banned from driving for a year, with a £100 fine, a £20 victim surcharge, and £85 costs. He had pleaded guilty to driving with illegal levels of a cannabis metabolite in his blood. Rachid Elhajoui, 35, of Clive Way, Crawley, was given an eight week jail sentence, suspended for 18 months, with an £80 victim surcharge, and £85 costs. He had pleaded guilty to growing cannabis plants. Wendy Freeth, 37, of Kelmscott Rise, Crawley, was given an eight week jail sentence, suspended for 18 months, with an £80 victim surcharge, and £85 costs. She had pleaded guilty to using threatening, abusive or insulting words or behaviour to cause fear of violence, and possessing an offensive weapon. Ashton Gordon, 24, of Linnell Close, Crawley, was fined £40, with a £20 victim surcharge, and £85 costs. He had pleaded guilty to obstructing a police officer. Sharon Hall, 46, of Perth Close, Crawley, was given a community order with 180 hours of unpaid work, a £60 victim surcharge, and £85 costs. She had pleaded guilty to two counts of failing to notify a change in circumstances affecting her entitlement to benefit, and one count of making a false statement to obtain benefit. Mark Robertson, 48, of Millais Close, Crawley, was banned from driving for five years, and given a community order with a £60 victim surcharge, and £85 costs. He had pleaded guilty to drink driving at Crawley. Court records say he had 355mg alcohol in 100ml blood, more than four times the legal limit of 80mg. Abdellatif Moubtahij, 55, of St Patricks Road, Taunton, was given a one year conditional discharge, with a £15 victim surcharge, and £625 costs. 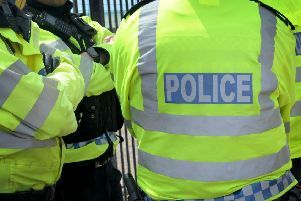 He had been found guilty of using threatening or abusive words or behaviour, and resisting a police officer, both at Gatwick, and pleaded guilty to causing criminal damage to a police cell, and failing to answer bail. Ronnie Coleman, 26, of Strachey Court, Broadfield, was given a community order with 100 hours of unpaid work, a £60 victim surcharge, and £300 costs. He had pleaded guilty to common assault. A restraining order was made, barring him from contacting the victim. Ben Macconnell, 28, of St James Walk, Broadfield, was given a four month jail sentence, suspended for a year, with 60 hours of unpaid work, a £60 victim surcharge, and £85 costs. He had pleaded guilty to two counts of common assault. Ricky Coombs, 23, of Enfield Road, Crawfield, was fined £100, with a £20 victim surcharge, and £100 costs. He had pleaded guilty to resisting a police officer in Crawley, and admitted breaching a conditional discharge. Mark Maynard, 29, of Highbank, Haywards Heath, was fined £150, with a £20 victim surcharge, and £100 costs. He had pleaded guilty to withholding information in order to obtain vehicle insurance, and to using threatening or abusive words or behaviour in Crawley.